Cape Town – New Zealand, more so even than at Newlands in their first-Test humiliation, are likely to severely rue the absence of stalwart left-arm spinner Daniel Vettori from their squad mix when they tackle the currently rampant Proteas in the follow-up at St George’s Park from Friday. The Port Elizabeth venue is one of those on the global Test map where teams are particularly ill-advised to go in without a specialist spinner – and sometimes even two is the correct prescription, if the often slow and low surface looks like crumbling markedly over the last couple of days. It remains a laboured and sometimes painful process, but a spin culture is beginning to take promising root again in South Africa, more traditionally home of snarling, snorting fast bowlers in modern times. 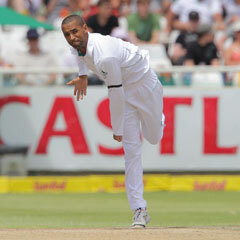 The No 1-ranked Proteas will be at least reasonably confident that incumbent left-arm spinner Robin Peterson -- who publicly expressed this week his relish for making his likely first, Test-level appearance at an old stomping ground -- will deliver the goods for them in this intended series clincher. He may get some tidy enough part-time aid, too, from rookie middle-order batsman Dean Elgar and also Faf du Plessis, who offers leg-spin variety – although the South African pace arsenal is usually frisky and resourceful enough these days to be a game-altering factor regardless of conditions. But what of the beleaguered tourists’ counter in the slow-bowling department? The dice seems only loaded against them further, given that indisputably world-class, seasoned Vettori, a former captain and veteran of 112 Tests, has stayed at home from this venture because of lingering rehabilitation from hernia and Achilles injuries. Apart from his wicket-taking ability, left-armer Vettori has always been a decent pressure-builder for other New Zealand bowlers, given his knack of keeping one end quiet from a scoring-rate point of view even if he is struggling for scalps. He had also become an integral part of the Black Caps’ vulnerable batting make-up, with his dogged competence in slots anywhere from Nos 6-8 – a kind of grit that has seen him amass six Test centuries and average just over 30. By contrast, in the Newlands Test where they were bullied, to a good extent, into defeat, off-spinner Jeetan Patel earned no medals for bravery at the crease – he spent much of his limited second-knock stay shuffling out of line toward square-leg for ribs-and-head-preservation purposes. In fairness, he wasn’t the only one, and he is also not customarily expected to provide anywhere near the sort of resistance and calibre of stroke-play someone like Vettori is capable of. New Zealand’s spin quandary is aggravated by Patel lacking any real threat at Newlands (he registered nought for 60 in 17 overs in the lone SA innings), and being successfully targeted for powerful, over-the-top driving by the likes of ton-maker Alviro Petersen and Jacques Kallis. There has been talk in the New Zealand papers of Patel (18 Tests over a seven-year period, average 46.78 and only one five-wicket haul against West Indies at Napier) possibly being replaced by 32-year-old left-arm spinner Bruce Martin. But the last-named player would also not strike instant fear into Proteas batting hearts: he has been a first-class journeyman for more than a decade (bowling average at that level almost 35) and has no senior international experience of any kind. It is whispered that the fact that he scored a maiden century for Auckland earlier in the season may be his passport to duty in place of Patel, perhaps slightly shoring up the Kiwis’ tail.